Wednesday, 13 May 2015. Today Cordell Expeditions signed a contract with Nigel Jolly, owner and operator of the Braveheart (above), for the expedition to Heard Island, and moved the project schedule to March-April, 2016. 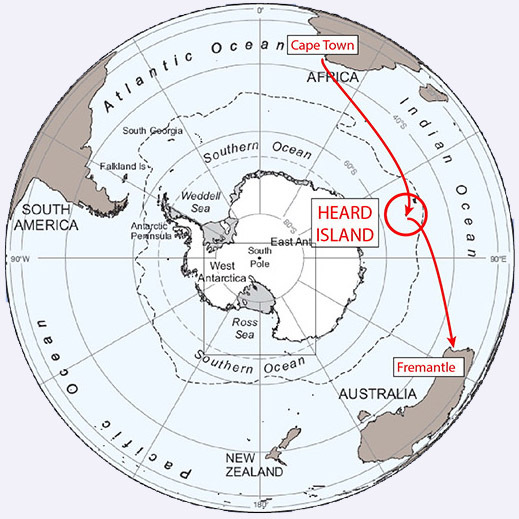 The ship will depart from Cape Town, South Africa, proceed directly to Heard Island, and finally to Fremantle, Australia. The stay at Heard Island will be nominally March 16 – April 8, 2016. The nominal 21-day stay at Heard Island will enable amateur radio operations, using the call sign VKØEK. While the radio operation is the primary goal, the team will also carry out a limited scientific program, including a search for new species that can enhance our understanding of biodiviersity and the effects of climate change. The new contract resulted from the inability of Heritage Expeditions to deliver on its promise of providing a safe and supported operation at Heard Island using the Russian vessel Akad. Shokalskiy. Obviously, the conversion to the new vessel and schedule will require adapting the team and the project activities, but the major goals of the expedition remain unchanged. We are grateful to the Northern California DX Foundation and numerous other organizations, and many, many individuals for their generous support of this project. We will update the various documents and websites in the near future, and hope that you will continue to follow the progress of the expedition. For further information, please contact the Expedition Leader, Dr. Robert Schmieder, schmieder@cordell.org. ← Find Us at Dayton in the Array Solutions Booth!